We are happy to announce support for .NET functions in AWS Lambda. Now, with Thundra's latest release, developers can collect observability data from their .NET functions, including logs, metrics, and trace data.A large part of Thundra's mission is to help serverless applications become a mainstream reality for all software organizations. For us, aiding adoption includes giving developers straightforward and easy methods for observability throughout all parts of a serverless application lifecycle - development, testing, and production. To date, there has been no full observability support for .NET functions. However, .NET remains a very popular framework for building C# applications and is included as one of AWS Lambda's core supported languages. 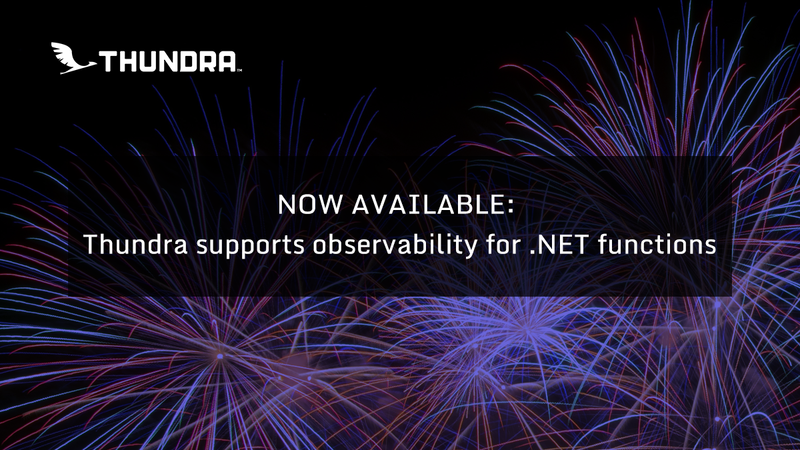 To fill this cap, Thundra now supports full observability for .NET functions. Thundra’s .NET agent collects monitoring data in the form of metrics, logs and traces, thus covering the three pillars of observability. We've also worked hard to make the installation and set-up a seamless, straightforward experience with dotnet CLI templates. With few simple commands, developers can add monitoring to their .NET Lambda functions even more easily than monitoring with CloudWatch logs. Thundra is free to use and set up takes only a few minutes. Get your account and start using Thundra today.